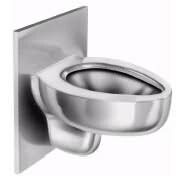 [XPB-WC7180] *DISCONTINUED* Chase-Mounted Wall Hung Blowout Jet Stainless Steel Toilet is fabricated with a bead blast finish with a hinged plastic seat. There are four options to choose from: Which Toilet Seat, Flush Valve, Wall Thickness (0-4", 4"-8", 8"-12") and Finish ( Bead Blast or Polished Stainless Steel). Specifications and details for upgrades available upon request. For shipping quotes, orders or questions please call our Customer Service Center at 1-877-483-9270.